Enjoy a luxurious seven day Atlantic crossing on the magnificent Queen Mary 2 and arrive in style sailing past the Statue of Liberty. Then spend three nights in New York City before going North to witness the awesome spectacle of Niagara Falls. You should arrive in Southampton, where you will be greeted by your dedicated tour manager when you embark the newly refurbished and spectacularly sophisticated Queen Mary 2 for your unforgettable Transatlantic Crossing to New York. As she glides westbound, make the most of your seven leisurely days on board arguably the most extraordinary and luxurious vessel on the seas. Attend one of many insightful talks by experts and celebrity speakers, or catch up with friends in the brand new Carinthia Lounge. When night falls, get dressed up and attend a glamorous black-tie gala ball in the elegant Queens Room. Early this morning Queen Mary 2 arrives in New York harbour. Nothing quite prepares you for the panoramic view of the iconic Manhattan skyline and the towering Statue of Liberty, reflecting the very essence of the USA to be the biggest and the best. 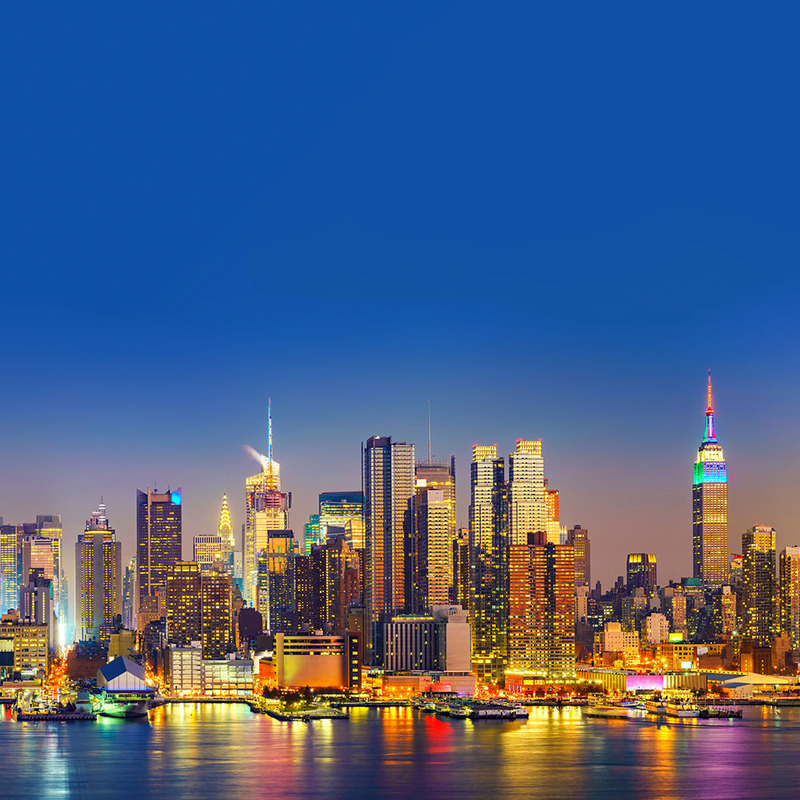 Upon disembarking, we will enjoy a fascinating tour of New York City, taking in the most amazing sights, including bustling Times Square, famous Rockefeller Centre, and the landmark Empire State Building. Then check in to your hotel for the next three nights, the iconic four-star Marriott Marquis, one of the first hotels in Times Square. You have three glorious days to explore the Big Apple and its multitude of world-class attractions. See more than 5,000 years of art from around the world at the Metropolitan Museum through its intriguing exhibitions and events. Or visit the Guggenheim, as famous for its landmark building designed by Frank Lloyd Wright, as it is for its impressive collection and daring shows. An unusual yet welcome highlight is High Line Park, a lovely 1.5-mile-long stretch of green space built on an elevated section of an old railroad. Take a walk through colourful Chinatown and explore its streets lined with shops selling exotic foods, jewellery and various gifts. Here you’ll find some of the best restaurants representing the cuisine of not only the numerous provinces of China, but also of Hong Kong, Indonesia, Malaysia, Vietnam and more. Then there is St Patrick’s Cathedral, a breathtaking masterpiece of Neo-Gothic architecture and significant landmark that stands out amidst the city’s many contemporary buildings. Why not take a helicopter flight over this most photogenic of cities to see it all? Or visit the impressive Statue of Liberty on Liberty Island. In the evening, find out why this is the City that Never Sleeps – soak up the atmosphere in Times Square or simply relax in Greenwich Village’s intimate bars. This morning, we board our domestic flight to Buffalo in upstate New York, located on the shores of Lake Erie. A short drive takes us across the Rainbow Bridge over the border to Ontario, Canada, where we stay two nights in the four-star Sheraton on the Falls with lovely views of Niagara Falls. Niagara Falls has long been a magnet for daredevils, sightseers and honeymooners, but there are few superlatives that can describe the sheer spectacle in front of you, as the equivalent of more than a million bathtubs full of water cascade every minute over a 61-metre-high cliff, crashing in a deafening roar below. You can see this incredible natural phenomenon from all angles to really experience its sheer power and beauty. 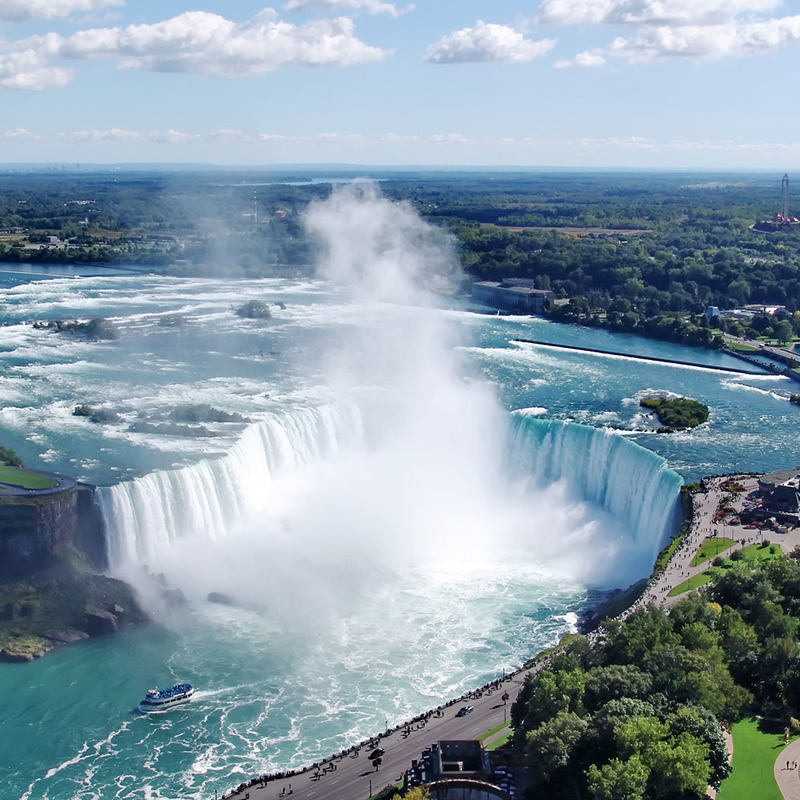 Included with your tour is a thrilling boat ride on the famous Hornblower Cruise to get you as close as possible to the thundering waters at the base of the Falls. We can get even more intimate with the Falls and explore the tunnels, staggeringly behind the very waterfalls themselves, for an astonishing view of the massive wall of water but from the inside. 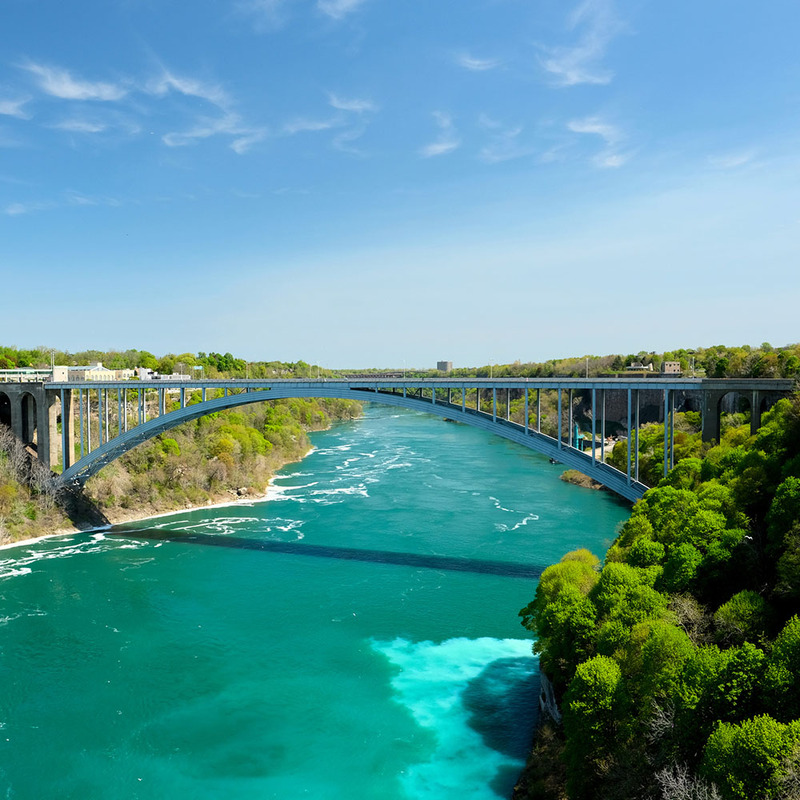 You could also take a lift, walking along the bottom of the Niagara Gorge for a truly spectacular close-up view of some amazing white-water rapids. This morning, we bid farewell to Niagara Falls and head to the small community of Niagara-on-the- Lake, located at the heart of Ontario’s wine region. Often cited as the prettiest town in Ontario, it is a fascinating insight into a well-preserved 19th-century village with its charming Victorian architecture. This wonderfully lovely town is hometo the world-class theatre, the Shaw Festival, and many historical sites. We then head along the scenic shore of Lake Ontario, one of the five Great Lakes, to Canada’s largest city, Toronto. Its soaring glass skyscrapers contrast with the verdant parks and lakefront boardwalks of a host of communities. 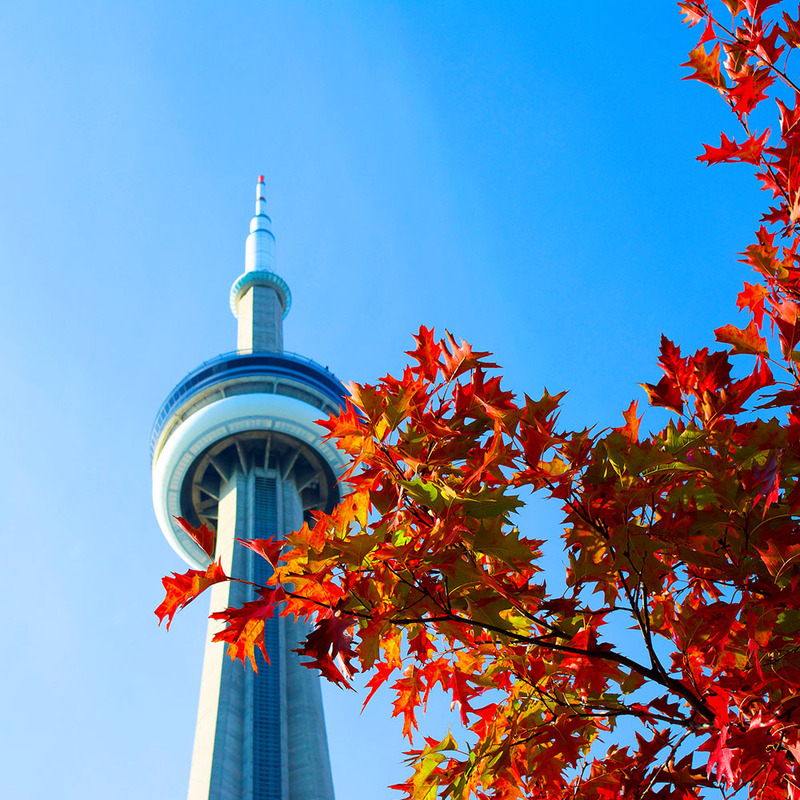 Dominating the skyline is the 553-metre CN Tower, the tallest freestanding structure in the western hemisphere. You will take an exhilarating ride in its exterior glass lifts to the observation deck, where you will be rewarded with stunning views and a glass floor reveals a jaw-dropping perspective of the city. Later, we continue to Toronto airport for your overnight flight home. We arrive back in the UK after a once-in-a-lifetime journey across land and sea. The price of the holiday is per person, based on two people sharing a cabin/room. 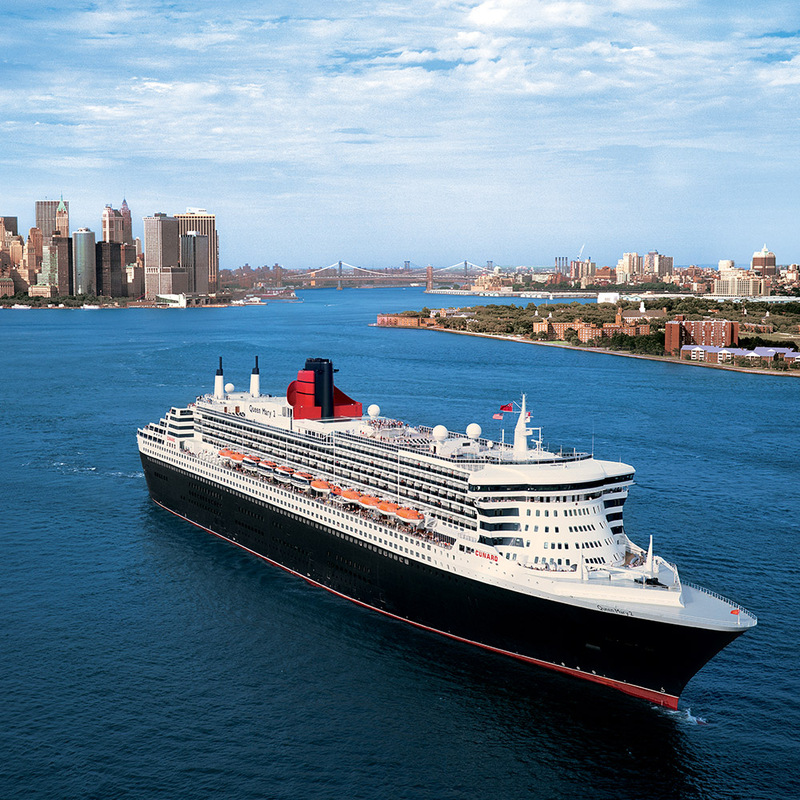 The price includes 7 nights aboard Queen Mary 2 including all meals, 5 nights in hotels on a room only basis, hotel porterage of one item of luggage per person, return flight from Toronto and all tours & visits as detailed in the itinerary. 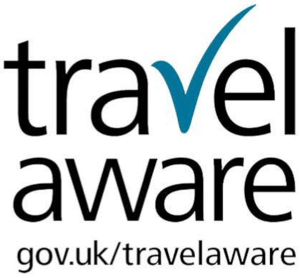 Includes services of a Riviera Travel tour manager.